Why Is Fall the Best Time for Lawn Aeration and when Should It Be Done? If you have a cool season lawn like fescue or bentgrass, then the best time for lawn aeration is the fall – preferably at least one month before the threat of frost arrives. If your soil is particularly clay-heavy, your grass could benefit from more frequent aeration regardless of turf type. Aeration assists the grass in absorbing water and nutrients, and it can prevent water runoff waste. Dense soil compacts more easily and should be aerated more frequently to keep the grass roots healthy. What’s the difference between warm and cool season grasses, you might ask? Cool season grass is mostly dormant in the winter, and becomes active in the fall in preparation for a lush, green lawn all winter. This flip in the seasons is why right now is the ideal time to aerate cool season grass. Warm season grass, on the other hand, is approaching its dormant phase in the fall. Warm season grasses like Bermuda and Zoysia should therefore be aerated in the spring. This prepares the grass roots to absorb everything it needs to get through a vigorous summer growing season. Which aeration method is best? You also have a choice of aeration methods. All of the experts agree that core aeration is the best choice for the average lawn. Spike aeration involves jamming spikes into the soil below the grass. It doesn’t do a very good job of leaving voids in the soil for allowing the transfer of water, air, and nutrients to the grass roots. Core aeration actually removes plugs of soil from below and deposits them on the soil surface. Each of the little holes left behind is the perfect size and depth for improving root health. It’s common for homeowners to have no idea what type of grass in planted in their yard. This is one of many reasons why bringing in a professional lawn care company is an excellent idea. Too many people try to DIY their lawn care, and they end up with lackluster results. Applying too much fertilizer, not enough weed control products, aerating at the wrong time, watering too frequently, trimming the grass too short – all of these things can easily destroy your lawn. Atlanta’s mild winters means that some folks have warm season grasses, and some have cool season grass. This is why it’s so important for local lawn care companies to pay close attention to each client’s turf type and recommend the appropriate services at the right times of year. 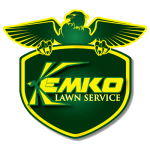 Kemko Lawn & Shrub has over 30 years of experience serving Atlanta’s homeowners; we know just what your lawn needs, and we are prepared to deliver complete customer satisfaction. Have questions about the best time for lawn aeration? Click to see if it’s on our FAQ list.